Tal Sweet and Matt Pedersen from the Marine Breeding Initiative once again take stock of marine ornamental fish breeding, with a new twist: we’re excited to introduce the cursory, first compilation of a captive-bred marine ornamental invertebrate species list! Excerpt from March/April 2018 issue of CORAL Magazine – subscribe today! Since CORAL started compiling this list in 2013, breeders from around the world have continued to make impressive gains in the captive culture of marine aquarium ﬁshes and other organisms. Whether it’s an intrepid hobbyist with a breeding project in the basement, a university-funded project, or a full-ﬂedged entrepreneurial venture, anyone has the potential to make the next great discovery—wherewithal doesn’t guarantee success. A Reef Butterflyfish, Chaetodon sedentarius, cultured for the first time by Rising Tide participants in Florida. Cuban Basslet, Gramma dejongi, a species first, accomplished by Todd Gardner. Early in 2017, Todd Gardner, of Suffolk County Community College in Riverhead, New York, was among the first to claim a species ﬁrst, bringing the off-limits Cuban Basslet (Gramma dejongi) into captive cultivation in his Long Island lab. Due to the Cuban trade embargo, it took tremendous effort to legally obtain the broodstock, but after considerable back-and-forth with the U.S. Government, it was determined that the captive-bred F1 offspring were not subject to the embargo and could be legally distributed throughout the United States. It’s fair to suggest that if this vibrant species gets a solid foothold in the U.S. trade, we’ll have Gardner and his associates to thank for it. In similar fashion, Karen Brittain, working in her home lab on Oahu, Hawaii, successfully produced the world’s ﬁrst captive-bred Hawaiian Yellow Anthias (Odontanthias fuscipinnis). Frank Baensch had succeeded in rearing this species from wild-collected eggs in 2013. Attendees of the 2017 Marine Aquarium Conference of North America (MACNA) in New Orleans were astonished by the news that Poma Labs, co-founded by Dr. Matthew L. Wittenrich and Nuri Fisher, had been successful at breeding multiple species of Chaetodontoplus spp. angelﬁshes. 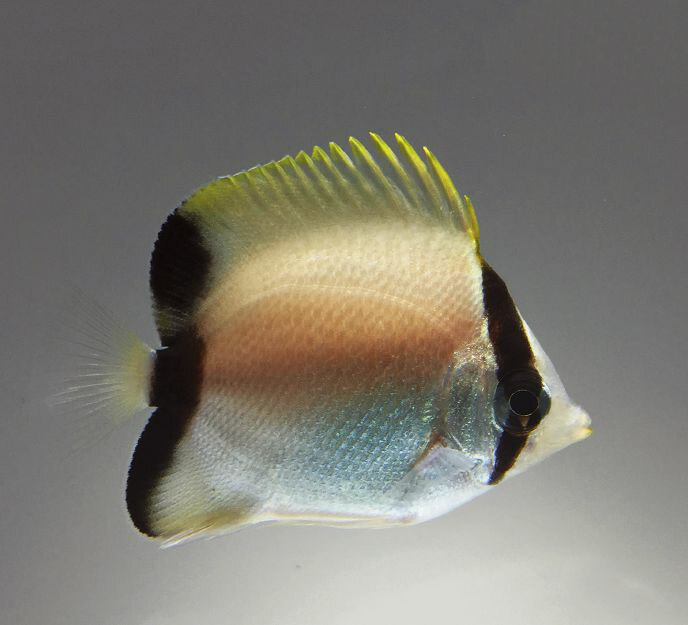 In addition to a few species that had been bred before, they bred four species for the very ﬁrst time, including the Conspicuous Angelﬁsh (Chaetodontoplus conspicillatus), a “Holy Grail” ﬁsh that currently retails for between $4,000 and $5,000 (see “Poma Rising,” page 30, CORAL Magazine, March/April 2018). On another front, Wittenrich and Minnesota-based Chad Vossen were unaware that they were in a race to see who would be first to breed the highly coveted Ornate or Bellus Angelfish (Genicanthus bellus). It’s clear that Vossen was first to publish his success (via Facebook), but upon comparing notes, Vossen and Wittenrich acknowledged that Wittenrich accomplished the goal first. 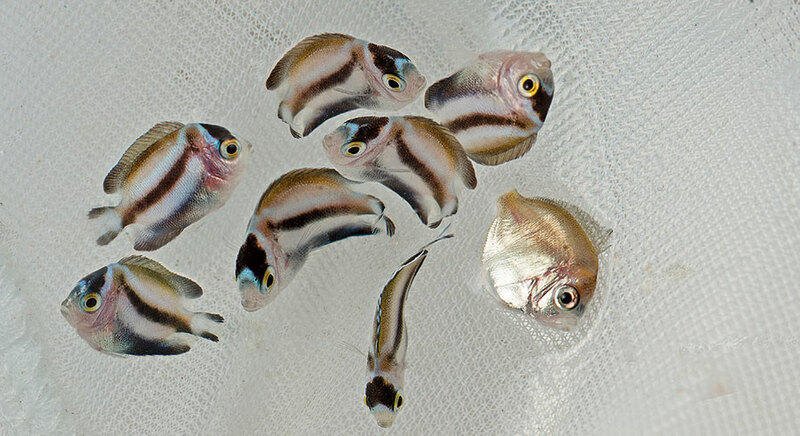 Early in 2018, there will be a small, publicized release of captive-bred Bellus Angels direct to aquarists in the United States by Poma Labs. Genicathus bellus captive-bred marine angels by Matthew L. Wittenrich at Poma Labs. On the other side of the planet, in Palau, Tom Bowling of Biota Aquariums has continued to work with smaller ﬁshes. Biota has raised several new goby species, including the Snoutspot Goby (Amblygobious esakiae), the Speartail Goby (Amblygobius calvatus), the Grooved Dwarfgoby (Trimma caesiura), and the Signal Goby (Signigobius biocellatus). 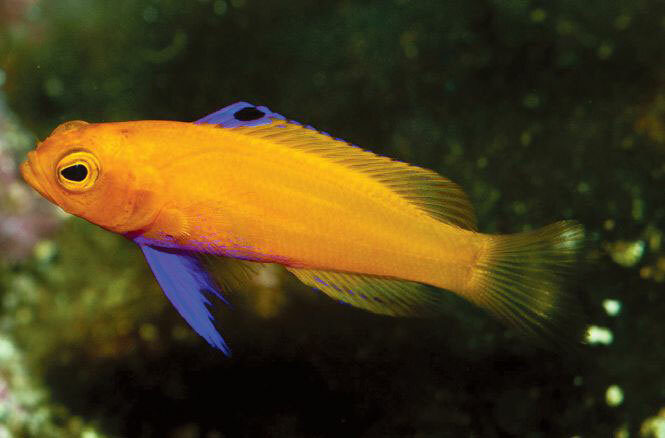 Most notably, Biota grabbed attention in late 2017 with the breakthrough production of the Borbonius Anthias (Odontanthias borbonius). This rarely-seen deepwater Anthias is a high-priced ﬁsh associated with diver risk, so seeing it available as a captive-bred offering is reason for applause. Odontanthias borbonius, Borbonius Anthias, a rare and expensive deepwater species brought into culture in the last year. 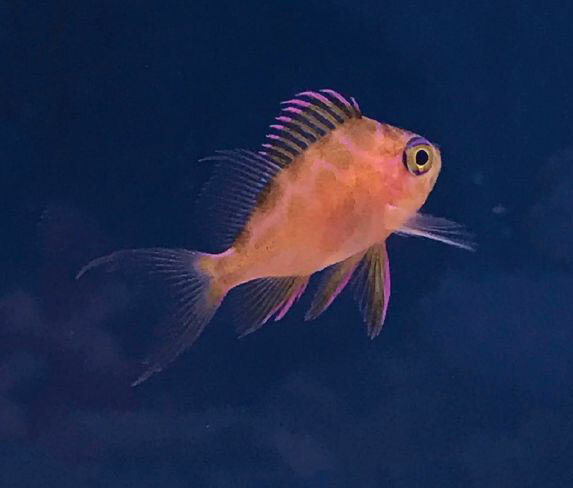 Last but not least, Oceans, Reefs & Aquariums (ORA) has added the Yellow Cardinalfish (Ostorhinchus luteus) to its always-growing list of captive-bred ﬁrsts. This, along with a handful of other species ﬁrsts, now brings the number of marine aquarium ﬁsh species that are known to have been successfully bred in captivity to 358. While this is a major achievement, there is still much work to be done—many of the species on the list are only available in very small quantities or have been one-offs. Given the recent alarming developments in banning ornamental fish collection in Hawaii, the hobby has arrived at what may be a crucial point. Without access to wild-caught broodstock, it will be impossible for anyone, other than universities and commercial entities, to continue to work on breeding more species. Pressures such as these make it more important than ever to support those who are working on captive-breeding projects. For the individual marine aquarist, purchasing captive-bred fishes and aquacultured corals whenever possible is probably the easiest and most effective way to support these pioneering efforts. Check out Part II of this story for our first-ever attempt to capture and record the depth of marine ornamental invertebrate species that have been captive-bred, some of which are routinely available in the aquarium trade. Green = Commonly Available. Easy to find as a captive-bred fish, often from more than one source, throughout 2017. Blue – Moderate to Low. Might have taken some searching, and availability may have been limited, potentially only with one source, but was reasonably obtainable as a captive-bred fish in 2017. Purple = Scarce. Generally only one source or breeder is known, and potentially only a handful of specimens may have been available. You may have “had to know someone” or even know the breeder directly in order to obtain them as captive-bred fish during 2017. *Provisional listing, minimal to no published proof, but from trusted source. 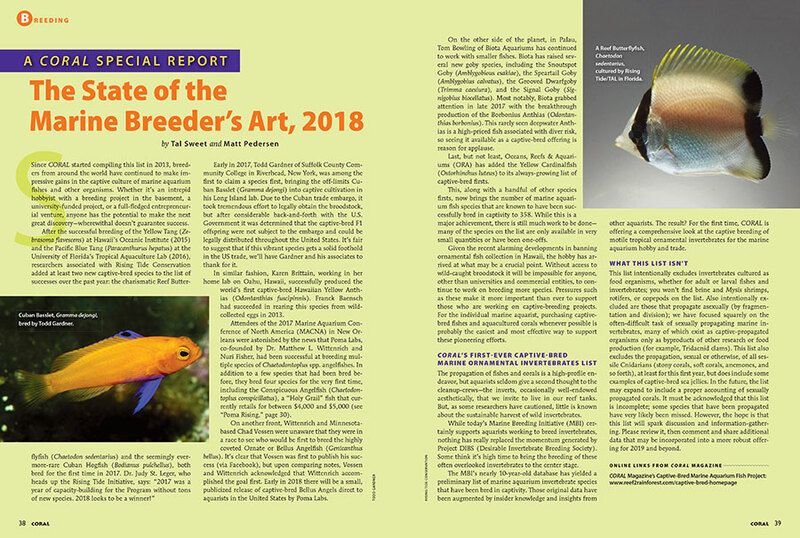 **Not first accomplished in the last year, but new to the list for 2018, as they are produced and distributed by participants in the aquarium trade, even if public aquariums are the main audience for these large fishes. These species “ride the line” as both gamefish and public aquarium fish, moreso than ornamentals for private, home-based husbandry.